There was a time, not so long ago when I was watching five TV series, knitting and crocheting consecutive projects, reading three magazines a month and feeling, well perhaps a little bored. Working four to five days a week took a little bit of getting used to, but after six weeks I reached a level of match fitness which enables me to read late into the evening one night a week. 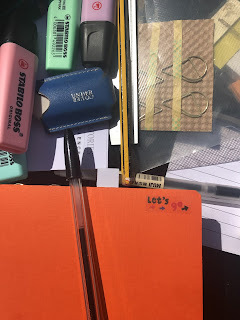 Nine weeks on, I am now finding my feet and have realised that I have to approach University as another job, so that I can keep on top of my work and produce assignments at the level my tutors are looking for. Of course it's not all rose-tinted textbooks; there are times when I feel like my head is going to spin off my neck and many nights when I can't switch off and sleep feels miles away. But am I happy. Much happier than I have been in ages. I am finally learning the truths of the subject I have been second-guessing for years. Your amazing Emma, doing all this as well as the incredible mother you are!